I wrote and recorded this demo in the fall of 2009. All instruments and programming are me. And if I'm not mistaken, this is the recording debut of my Rickenbacker 330. I originally wrote and recorded this demo in 2009. I recently re-recorded the vocals and polished the mix a bit. All instruments and programming are me. This is a recent demo of a song I wrote in the mid-eighties, and which was performed in a just slightly different arrangement by *Batteries Not Included. All instruments and programming are me. The Rickenbacker 330 is featured prominently here, and unlike most of my demos, the bass line is not programmed, I actually played this on the bass. The first song I recorded with Apple's Garageband, spring 2004. A pretty faithful cover of a song by XTC from their 1986 album Skylarking. My second song in Garageband. This was a minor hit for The Ocean Blue back in the 80's. My third Garageband song, another very faithful XTC cover, from their album The Big Express. I did this primarily to see if it was possible to duplicate the rather complex production on the song. My own arrangement of the 80's hit by Howard Jones. The vocals have been touched up, but I think they still need to be re-recorded. This cover of the song from "Chitty Chitty Bang Bang" was inspired by the fact that I sang this song to my daughter as a lullabye pretty much every night when she was a baby. Glenn Tilbrook had been touring solo to promote his own solo album, "The Incomplete Glenn Tilbrook," and on the tour, he'd been getting requests to do "From A Whisper To A Scream," a song on which he had done a duet with Elvis Costello, which appeared on Elvis' album "Trust". So, who sang the Elvis part? Somebody from the audience. 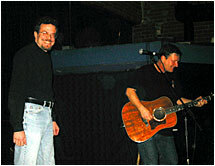 In November 2002, Glenn came around to Arlington, to club Iota. This time, I was the only volunteer. He prefaced the song by saying it would be a "crueler" version, where if the audience didn't like me, they could vote me off, in the spirit of reality TV. With that in mind, we launched into the song. I sang Elvis Costello's part, Glenn sang his part and played guitar, the crowd were kind, the sound system was good, and the song was a rousing success, bringing me lots of compliments afterwards. And that was that, or so we thought. It turns out somebody at the show was secretly taping it. Ellen got wind of it on an online chat list, and got a copy of the show on CD-ROM. It was taped with a tiny hand-held tape recorder, so the quality is a bit shaky, but you can hear it pretty well. 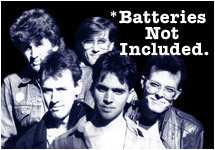 Check out the *Batteries Not Included page. Site content ©2004-2011 Steve Dockery, except where otherwise noted.